Nobody said it would be easy, holding up the fusion flag on a stage still dominated by the mighty oil and gas industry. 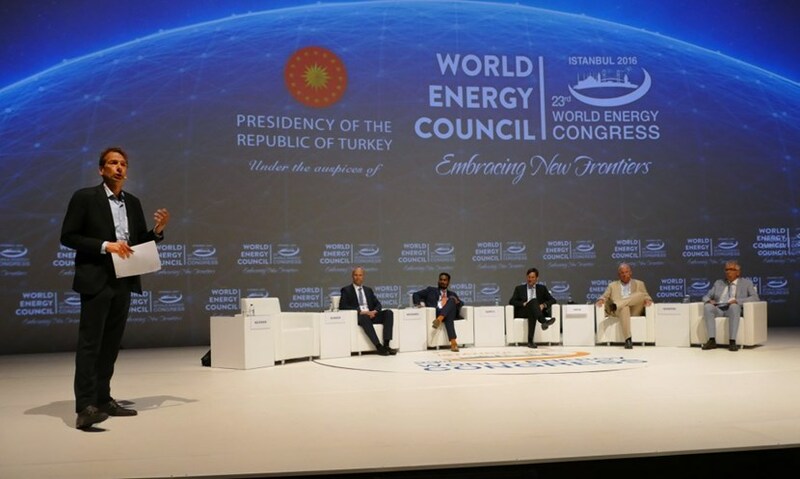 But at the 23rd World Energy Congress (WEC) taking place in the city of Istanbul, Turkey, fusion was present. Thomas Klinger, project director of the Wendelstein 7-X stellarator at Max-Planck-Institute for Plasmaphysics in Germany, took up the challenge and participated in a session titled "Technology Innovation Frontiers," where he made the C.A.S.E. for fusion, introducing fusion energy as a potential baseload energy option and explaining why fusion energy—in contrast to many other options—is clean, abundant, safe and economic. The video-screen background of the vast stage in the Istanbul Congress Centre gave a stark reminder of what is at stake when discussing the future of energy: planet Earth, enveloped by its oh-so-fragile atmosphere. "Today we meet at a critical time," said the co-chair of the conference, Younghoon David Kim during his opening address, reminding participants that the global demand for energy is predicted to double by 2060. "Limiting global warming to no more than 2 °C will require exceptional and enduring efforts. We are moving from peak oil to peak demand; leadership at all levels is critical."